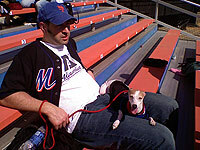 MetsToday is owned and operated by Joe Janish, a freelance writer and online media specialist / web developer. You can learn more about me on my Facebook page, LinkedIn profile, by reading this nice article on Bronx Banter, or this lengthy yet undeniably fascinating Q&A on Mike’s Mets. This site is unique in that the author is not only a professional writer (yes, I’ve been paid to author articles, books, press releases, marketing materials, etc.) but also a current baseball instructor and former NCAA D1 baseball player and coach. Several of the players I’ve coached and/or instructed have gone on to play professional baseball — one has been in MLB since 2001. That said, the perspective you get here is from someone who has watched, played, and coached baseball at a fairly high level. MetsToday came about as part-evolution, part-failure, and part-frustration. In November, 2001, I started a website called “Joe Janish On Baseball”. Back then, the notion of a “blog” (or “web log” as it was known then) was still in its infancy, and only internet geeks such as myself had the wherewithal to create platforms for digital discussion. The plan for OnBaseball was to write articles, um, on baseball, with most of the content covering MLB news. After about a year of posting articles, it turned out that 95% of the content was about the Mets, and as a result was about to change the name of “OnBaseball” to something like “OnTheMets” or “MetsBlog” or similar. But right around that time, college student Bryan Hoch was forced by MLB to shut down his site, “MetsOnline.net”, for trademark infringement, cybersquatting, and other claims. Not interested in being sued myself, I removed all MLB logos and kept going with OnBaseball, but changed to a blog format. Eventually, MLB came to their senses and allowed fans to publish their own sites, and during the 2005-2006 offseason, MetsToday.com was born. OnBaseball.com is still around too, but it focuses on baseball playing fundamentals for players and coaches of all ages. If you play or coach, I encourage you to check it out. Disclaimer: This site accepts advertising to generate revenue to pay for the server fees to keep the blog running. These ads may or may not include graphical / banner ads, text links, and/or sponsored posts. Would you like to write a blurb about it on your site? Or may I? I have interviewed 80 Mets players from the early-to-mid 1960s and have purchased 20 photographs (of early Mets players) from the Cooperstown library.